Sciences, Philosophie, Histoire – UMR 7219, laboratoire SPHERE - Atoms,Mechanics and Probability. Accueil > Publications > Ouvrages parus > Ouvrages des chercheurs de SPHERE : 2015–... > Atoms,Mechanics and Probability. "One of the pillars of modern science, statistical mechanics, owes much to one man, the Austrian physicist Ludwig Boltzmann (1844-1906). As a result of his unusual working and writing styles, his enormous contribution remains little read and poorly understood. The purpose of this book is to make the Boltzmann corpus more accessible to physicists, philosophers, and historians, and so give it new life. The means are introductory biographical and historical materials, detailed and lucid summaries of every relevant publication, and a final chapter of critical synthesis. Special attention is given to Boltzmann’s theoretical tool-box and to his patient construction of lofty formal systems even before their full conceptual import could be known. This constructive tendency largely accounts for his lengthy style, for the abundance of new constructions, for the relative vagueness of their object—and for the puzzlement of commentators. 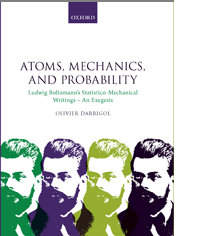 This book will help the reader cross the stylistic barrier and see how ingeniously Boltzmann combined atoms, mechanics, and probability to invent new bridges between the micro- and macro-worlds." • Accessible to various readers, be they interested in overview, in biographical aspects, in specific contributions, in philosophical-methodological issues, or in technical points of physics."